Description: perennial wildflower (1-4 ft.) with purple (ray) and yellow (disc) flowers in late summer-fall. Cut back after flowering to encourage a second bloom. 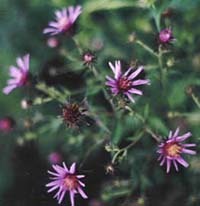 Great Northern aster generally grows in moist places-stream banks, forest edges, clearings. Sun, regular (moderate) water.